Celebrate T.H. 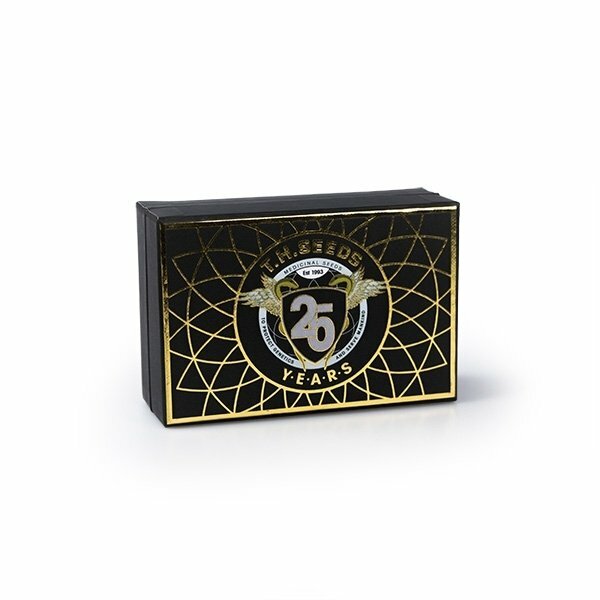 Seeds’ 25th anniversary with their Limited Special Edition Box Set with feminized 5-packs of their most popular strains: Bubblegum, French Cookies, Underdawg Kush, Darkstar Kush, MOB, and La S.A.G.E. Containing 30 award-winning seeds in total, the stylish box (retail price €290) comes with certificate, description card, and 25th anniversary sticker. Box can be reused as a stash box. T.H. Seeds is celebrating their 25th anniversary, and you can celebrate too with their Limited Special Edition Box Set! The 25th anniversary box contains 5-packs of their most popular cannabis strains: Bubblegum, French Cookies, Underdawg Kush, Darkstar Kush, MOB, and La S.A.G.E. for a total of 30 select cannabis seeds! This would normally retail for €290—that’s a whopping 40% discount! The stylish Anniversary Box comes with a certificate, description card, and a 25th anniversary sticker, and can be reused as a stash box. The T.H. Seeds 25th Anniversary Box Set makes a fantastic collector’s item and gift, but supplies are limited: You want to order fast so you don't miss out on this amazing deal! Celebrate 25 years of T.H. Seeds with the Limited Special Edition 25th Anniversary Box Set Special!